Epic and tragedy, from Homer's Achilles and Euripides' Pentheus to Marlowe's Tamburlaine and Milton's Satan, are filled with characters challenging and warring against the gods. 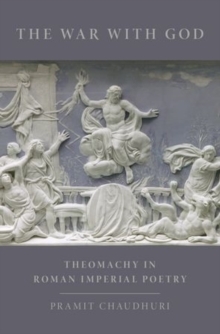 Nowhere is the theme of theomachy more frequently and powerfully represented, however, than in the poetry of early imperial Rome, from Ovid's Metamorphoses at the beginning of the first century AD to Statius' Thebaid near its end. This book - the first full-length study ofhuman-divine conflict in Roman literature - asks why the war against god was so important to the poets of the time and how this understudied period of literary history influenced a larger tradition in Western literature. Drawing on a variety of contexts - politics, religion, philosophy, and aesthetics - Pramit Chaudhuri argues for the fundamental importance of battles between humans and gods in representing the Roman world. A cast of tyrants, emperors, rebels, iconoclasts, philosophers, and ambitious poets brings to life some of the most extraordinary artistic products of classical antiquity. Based on close readings of the major extant epics and selected tragedies, the book replaces a traditionallyVirgiliocentric view of imperial epic with a richer dialogue between Greek and Roman texts, contemporary authors, and diverse genres. The renewed sense of a tradition reveals how the conflicts these works represent constitute a distinctive theology informed by other discourses yet peculiar to epic and tragedy. Beginning with the Greek background and ending by looking ahead to developments in the Renaissance, this book charts the history of a theme that would find its richest expression in a time when men became gods and impiety threatened the very order of the world. Covering a wide range of literary and historical topics - from metapoetics to the sublime, from divination to Epicureanism, and from madness to apotheosis - the book will appeal to all readers interested in Latin literature, Roman cultural history, poetic theology, and the epic and tragic traditions from antiquity to modernity.